SFC attend weekly meetings their freshman year focused on topics such as how to get involved on campus, start a student organization, apply for campus awards, etc. They will be partnered with a student mentor who has unique experiences, and will learn from various student and administrative leaders. The Undergraduate Student Congress of the Student Government Association is the House of the Legislative Branch. 48 Representatives make up the Undergraduate Student Congress comprised of equal representation of academic districts ranging from the University College to Education to Physical Sciences. Campus Activities Council initiates and implements quality campus-wide programs throughout the academic year to all facets of campus life, with an emphasis on building community, developing leaders, and leaving a legacy. 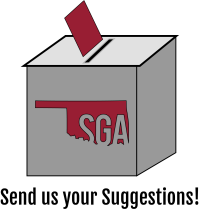 The Graduate Student Senate--the Senate of the Legislative Branch--represents every graduate student enrolled in any of the programs offered by the Graduate College at the University of Oklahoma, giving them an official voice in student government. Many student government positions are elected regularly by a student body vote. SGA holds one election in the fall and one in the spring. Elections for SGA Representatives and CAC Chair are coming up soon! Keep an eye out for more info! Also connect with us on Instagram! Keep an eye on this for all the things you need to know!